A great example is our Model E160, shown here. This system well illustrates the level of design competence and attention to detail necessary to deliver a product with highly-specialized features and capabilities. Although intended for a very specific application, this E160 system could be easily adapted or modified for virtually any other application in its power range. Thats about 1.5 to 5 kilowatts (1500 to 5000W). The E is our original high-power IGBT design, which can be expanded in capability up to 10KW, and beyond. For lower power applications however, you might use the EH (25 to 125W), the EF (up to 500W), or the EC (up to 1000W) models. This particular unit, the E160CT is special. It possesses a “center-tapped” high voltage output of 160 Kilovolts (two 80KV outputs, one being positive and the other, negative). It’s designed specifically for x-ray tube testing and burn-in. This is a process of “aging” or seasoning which every x-ray tube requires before it is considered salable. Such x-ray applications involve frequent and repetitive vacuum-arcing, an extreme environment which the “E” is designed to handle with ease due to our ultrafast overcurrent protection. Because this is an x-ray power supply, it also incorporates a 10-Amp AC filament output which is “common” to the cathode potential of -80 KV. Such floating, or “stacked” outputs require a sophisticated means of control and feedback in order to be accurate and reliable, facilitating complete adjustability and full-featured instrumentation (read more below). Hence this a multiple-output custom high voltage power supply (having cathode, anode and filament outputs), whereas the Standard Rack-Mount HVPS design has just one output. Again, this illustrates the flexibility incorporated into AEB’s system design, and the reason we excel at delivering custom high voltage power supplies. Insulation for the high voltage components is handled entirely by solid (dry) encapsulation. Our silicone encapsulant is rugged, reliable, clean and compact. Epoxies are also utilized when deemed appropriate. We rarely use messy dielectric oil, although it is required on certain designs. Sulphur Hexaflouride, Flourinert®, and other mediums might be used for very specific reasons. This system operates on single-phase 220VAC power, although other input configurations can be accommodated, as well. Many sophisticated features are available. (The E160 shown here possesses many.) Some of these options may be of interest to you, so lets review them. Your unique feature or function may be added to this list in the near future! Please contact us by telephone or e-mail if you have any specific questions regarding the E160… or your own custom requirements. We will assist you to the best of our abilities with care and enthusiasm. Packaging (enclosure) size depends on several variables: power output, voltage levels, system complexity, customer preference, among other variables, although it is always accommodated by the industry standard 19″ rack-mount enclosure. For much of the low-power line (like the EH), this consists of a single 3-1/2″ high enclosure, whereas the high power systems might utilize a 5-1/4″ or 7″ chassis. Whereas height varies in tandem with power ratings, the depth of the chassis is usually dictated by output voltage and complexity alone. Due to its complexity level and voltage rating, the E160 is housed in twin enclosures: two 8-3/4″-tall “power” and “control” sub-assemblies. The two enclosures communicate to one another via one Amphenol® and one D-subminiature interconnect cable. This twin enclosure configuration is a sensible design choice. It keeps the sensitive low-voltage electronics separated from the high voltages housed in the power section. This is done for performance reasons, as well as the obvious safety concerns. It also keeps the individual housings compact and light enough to be handled and installed by one person. As you can see, overall system dimensions depend on may factors. As a basic guideline, please refer to the table on our Standard Rack-Mount HVPS page to get an idea of size and scale. However, even these decisions can be tailored to suit your individual requirements. For the E160CT, the output connections are accomplished via two standard “Federal” type cable wells, located on the rear panel of the power section. This is because it is an x-ray supply. However, AEB offers a variety of other connector styles which are equally safe and far less expensive. Our standard HV output connector is a simple Amphenol®-type well plug. Note that our output plug precedes a cable protrusion at the HVPS mating end of the high voltage cable. This protruding end is inserted into a deep “well” receptacle, usually located on the rear of the power supply. The depth of the “cable well” (and length of the associated cable protrusion) depends on the voltage level. This dimension is roughly 1″ (2.54 cm) per 10,000V of output, although some minimum depth is usually employed for basic “finger” safety. The cable well is usually an integral component of the expensive hgh voltage multiplier assembly inside the HVPS, and is non-removable and non-reparable. Arcing inside the well would thus result in costly damage to the power supply. For this reason, we recommend that a special cable gel (or grease) be used to “pack” the well for insulative reasons. This grease is absolutely mandatory on all HVPS’s with output voltages greater than 30KV. An interesting E160 feature is the convenient overload adjustments, located on the front panel. Each overload (or overvoltage) setpoint is easily adjusted via a precision multi-turn trimpot, accessible through a small hole in the panel. It’s so easy! Simply push a button, and the built-in digital panel meter displays the overload setpoint directly. Adjust the accessible trimpot to the desired level, and then release the button. The DPM then resumes its primary function of displaying the actual output. Also noteworthy are our bright, easy-to-read LED meters. Our standard meters are 3-1/2 digits. 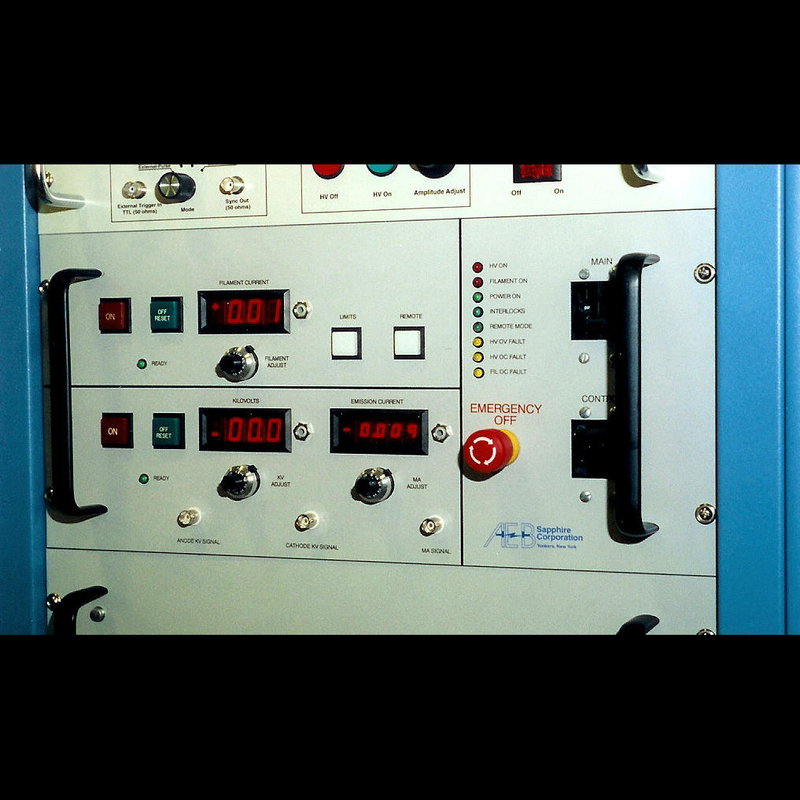 Here, we have a high-resolution 4-1/2 digit meter employed to read the Emission Current. This high resolution meter is useful for measuring very small currents, which was a customer request. A “zeroing” adjustment is also available to zero out these high resolution meters, although it was not requested on this particular system. These high accuracy features are an available option on all similar products. The DC voltage can then be interpreted by the regulator circuit, providing the accurate feedback necessary in a precision, regulated power supply. The feedback technique described above is an alternative approach to using fiber optic technology. In an optical system, voltage-to-frequency converter circuits must be used to converter the isolated output signal to a calibrated frequency. The “frequency” signal is then amplified and applied to a driver LED. The resulting optical signal is sent through a fiber optic cable, and received by ground-referenced (non-isolated) circuits. Here, the signal is converted back to a voltage, which can be utilized by the regulator. Although this technique might be preferable in some instances, it is often far more complex and expensive than the clever approach applied in our E160CT. This saves in cost and complexity, which is congruent with our mission of providing quality and value to our customers.